It's hard to believe we're at Grab Bag #30. That's an entire month of miscellaneous highsec miner tears! Speaking of months, dank dark was still sore about the bumping I gave him back in November. 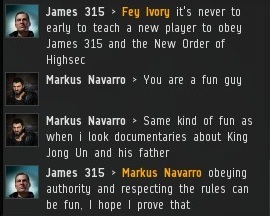 One advantage of being an Agent of the New Order: People will remember you forever. The rumor mill always twists things around. That's why MinerBumping.com is so important. You get your Code directly from the source! Simplicity is important in any government. It breeds accountability and clarity. 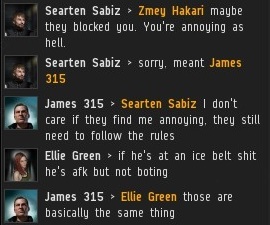 The chain of command in highsec is me, my Agents, and then all the other people. Below the people are the bots and bot-aspirants. Tip of the day: If you own multiple accounts, you can purchase multiple mining permits from the same character. 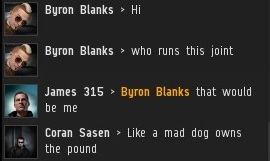 Just list your mining characters' names in the reason slot when transferring isk to me. Culture is something that can only be transformed one person at a time. 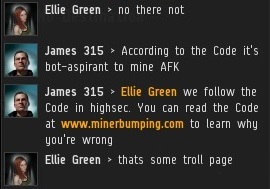 I immediately zeroed in on Ellie Green's lack of understanding of the Code. She was "green". Calling MinerBumping "some troll page" is like calling the Mona Lisa "some troll painting". Some people advocate change for change's sake. Others cling to traditions for tradition's sake. I strive to maintain the good things and change the bad. It seems like an obvious thing to do. You can chart the notoriety of the world's monsters by keeping track of how often I'm compared to them by angry miners. Kim Jong-un is going up in the world. Even after all this time, carebears still await the magic bullet mechanic to end miner bumping. I wonder how those "space anchors" are coming along? 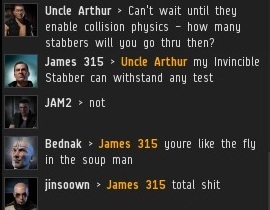 My Invincible Stabber is invincible, invulnerable, impenetrable, impervious, impregnable and pretty much anything else that begins with the letter "I". 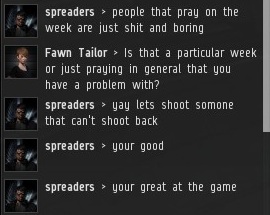 You know who complains the most about gankers who "shoot ships that don't shoot back"? Miners. Weird, eh? 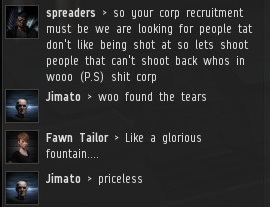 Luckily for the good guys, miner tears are a limitless resource. No need to conserve them; get greedy! I feel sorry for cats. Only nine lives? On occasion, I am notified of someone's private contract to me. Sometimes they're donations, and other times they're scams. Anjay Shardae is right about one thing: Couples can play EVE. I wouldn't recommend mining, though, because husband and wife will get used to wishing they were somewhere else. Carebearing is prelude to divorce. 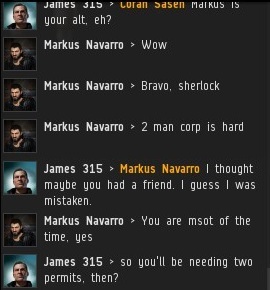 Enforcing the Code, on the other hand, is an adventure that brings people closer together. Before you sign up with a marriage counselor, try inviting your spouse on a miner-killing or miner-bumping op. I hope some day those Code violators will understand why they're the bad guys. It must be sad to live inside that entitling lie. 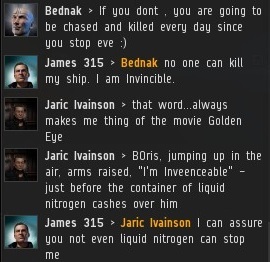 My wife thinks I have an "Invincible Stabber"
I have begun spreading the word of James 315 in my own little area of New Eden and admit that the code-violating miners are a stubborn bunch, but just more reason to continue the "education" process. Tough job but saving the miners from themselves makes it all worthwhile. Calling MinerBumping "some troll page" is insulting Trolls all over the world! 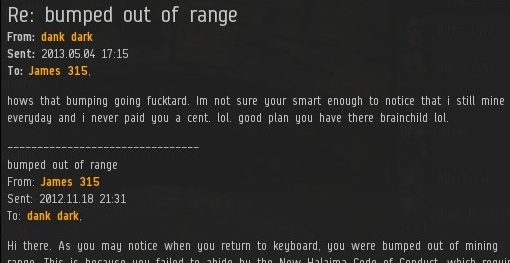 Trolls are very different from Miner Bumping fans. You should know Anon 11:02, as your comment is typical low-end trolling. Trolls are just looking for reactions, the New Order is looking for actions. 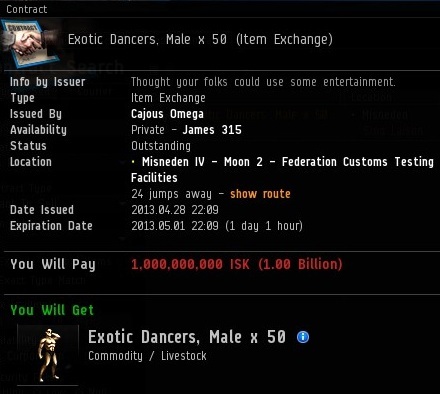 makes me wonder why cajous has so many male dancers. "Carebearing is prelude to divorce"
Then I ganked her and she left, haven't seen her since. Oh well. I hope she didn't receive custody of the children.. I'd hate for them to grow up to become bot-aspirants too! If by children you mean ships... I was able to save all of them from a boring life of aspirancy that ultimately led to their being ganked. 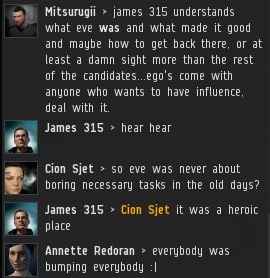 That private contract was quite the optimism boat. 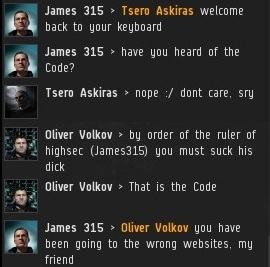 When trying to get 1bn isk off James, I always start by suggesting he and his bumper friends are homosexuals, and then place the items 24 jumps away from him. "Calling MinerBumping 'some troll page' is like calling the Mona Lisa 'some troll painting'." ... is like calling the Rosetta Stone 'some troll piece of rock'. ... is like calling Breaking Bad 'some troll show'. ... is like calling the Titanic 'some troll boat'. "Even after all this time, carebears still await the magic bullet mechanic to end miner bumping. I wonder how those "space anchors" are coming along?" That reminds me of the New Order's excursion to Abudban in November of last year, back when a space anchoring module was being proposed on the forums. Brings back memories... my first day with the New Order!